How do you measure the success of your leadership development programme? The UK Learning and Development Report 2018 shows that 94 per cent of the best performers surveyed say learning and development is critical to success. Almost two-thirds of companies with increased turnover in the past year rate leadership and management development as their top priority. The national average of £300 spent per employee on learning and development constitutes a big chunk of an organisation’s budget and it is essential therefore, that development programmes are successful, effective and represent an appropriate return on investment. Your organisation will probably have a leadership development programme in place. Candidates are typically selected to take part in this development programme as a result of demonstrating exceptional skills in the operational side of their role and they will have a willingness and an enthusiasm to progress. Leadership, however, requires a completely different set of skills. It requires people to let go of their technical skills, develop excellent communication and influencing skills as well as the skills to be visionary about the future and put together well thought through strategic plans. How then do you measure the success of the development programme? Traditionally this has been done in a number of ways including anecdotal evidence of performance or leadership style following the programme, an annual appraisal, subjective measurement against company behavioural competencies, subjective 360 degree feedback which is time consuming and therefore expensive to collect and collate to name but a few. Most methods have a large element of subjectivity which will affect the findings. So how can we eliminate the subjectivity from the measurement process? What if, at the start of a leadership development programme, you could objectively measure the group of candidates against a set of pre-defined leadership-specific behaviours? And then objectively measure them again some time down the line following the completion of the programme? Each competency is made up of a series of essential traits, desirable traits and traits to avoid. Development candidates complete a short, online SmartQuestionnaireTM, the result of 30 years research by Dan Harrison PhD who focuses on the link between results and the enjoyment factor. It is well documented that people who enjoy what they do produce better results. The SmartQuestionnaireTM therefore takes into account working preferences and cross matches 175 factors to define the individual’s ‘behavioural DNA’. 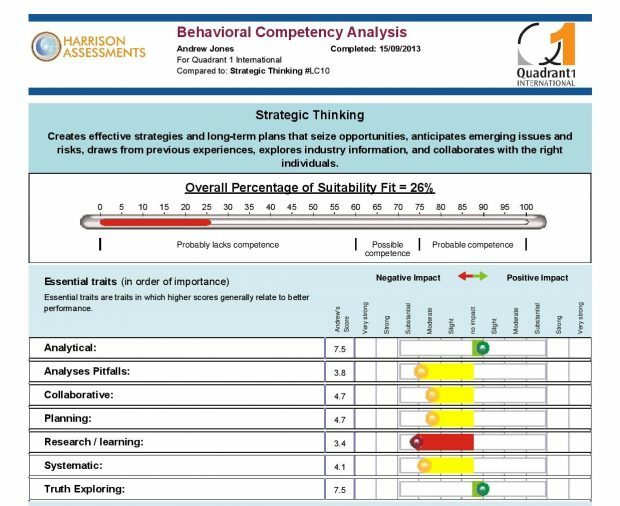 Responses are then mapped against each of the Harrison Leadership Competencies which can then highlights areas of strength and areas for development both for an individual and for a team. 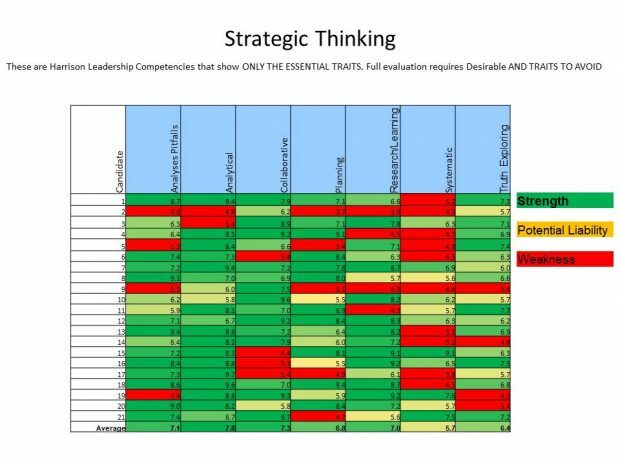 The image below shows a sample report for the Strategic Thinking Competency, and the responses mapped for the essential traits of this competency. We can see that Andrew Jones’* higher scoring essential traits – higher scores generally relate to better performance – are Analytical and Truth Exploring, where as his disinclination for Research/Learning could indicate this could be an area for further development. Once you have the group of individual reports, a team report can be created, as shown below in the example team report for the Competency of ‘Strategic Thinking’. This example is based on the team’s position before the commencement of the leadership programme. Candidate names have been replaced by numbers in the left hand column. The red areas show clearly the areas to focus on for development. The green areas denote the areas where individuals show a preference for work that requires type of behaviour. In this case, from the graph above you can see that the team shows a clear preference for analytical factors in their work, with responses predominantly illustrated in green, whereas the high number of responses shown in red under the ‘systematic’ column shows that further training and focus for development may be required to help the team become more systematic in their approach to work, if appropriate. A personal or team development plan and additional training can then be designed around the real objective data provided here. If a second questionnaire is then carried out some time later following the programme, once the candidates have had time to embed the learning, the two reports can be compared to see where the individual has improved against their earlier results, and where further development may be required. Comparison of the two reports can show with laser clarity ultimately whether the leadership development programme has been successful. The HATS behavioural competency also measures desirable traits and traits to avoid. The same measurements can be carried out for these to provide further evaluation. The HATS Leadership Behavioural Competency and other standard, pre-defined behavioural competencies are available. Bespoke behavioural competencies can be developed according to the requirements of your organisation and built around your own set of required traits and behaviours. If you would like to find out more about the HATS Leadership Behavioural Competency, other pre-defined competencies, or indeed about creating a bespoke competency, please call us on 07768 922244 or get in touch with us online. *Andrew Jones is a real person, whose name has been changed & who has given permission for his reports to be used as Harrison samples.